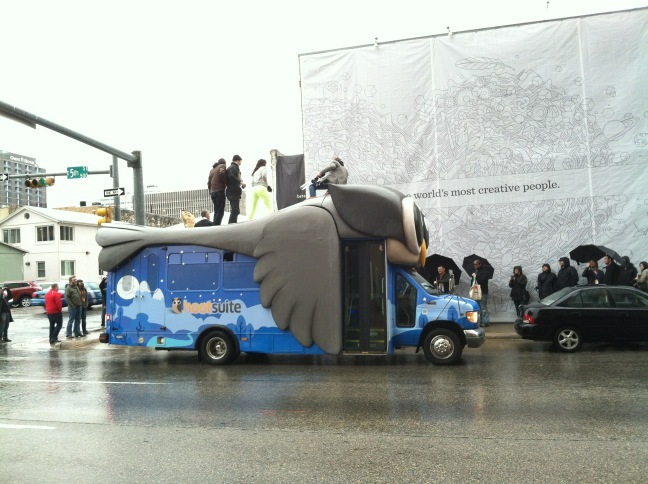 #SXSW 2012 – The Unveiling of the #HootBus! 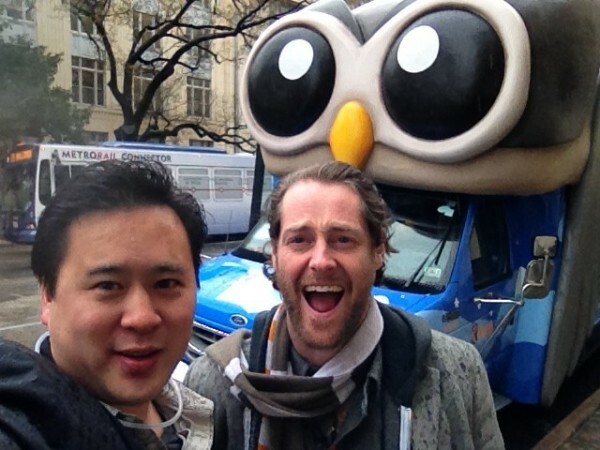 It’s only day one of SXSW Interactive and the HootSuite Owls have already made quite the splash. The elite team we’ve sent to Austin can be found all over the festival grounds – giving lectures, core conversations and attending spontaneous TweetUps. Get to know the team by checking out our SXSW prep post: HootSuite’s Owl Poised to Perch at SXSW 2012. Transporting the team is HootSuite’s newly finished #HootBus – an 18-seater strigiforme shuttle equipped with a CO2 powered t-shirt cannon, swag, and of course the HootSuite team! Ryan took a break from firing the cannons to lead the excellent “What If” UnConference session today (March 9) at PepsiCo Central, where he was seen whiteboarding the big trends in how data will change consumer experiences. There is a great Storify of this posted already and the team will be updating with multimedia and daily Livescribes of notes, doodles, conversations, and more directly from SXSW in Austin, TX. With sightings of the team and the bus popping up all over, let’s have a look at the #HootBus origins. Plus, let’s peek into VP Community Dave Olson‘s Core Conversation coming up on Saturday, March 10. In late 2011 SXSW vets, Dave Olson and Ryan Holmes, needed to find a way to transport HootSuite’s parliament of Owls around Austin during the festival. Originally envisioning a fleet of Owl bikes (which thankfully didn’t happen… #SXSWet), the two decided on a bus of truly grand proportions! Working with Blue Genie Art Industries, the HootBus began as a stripped down, humble transit bus. 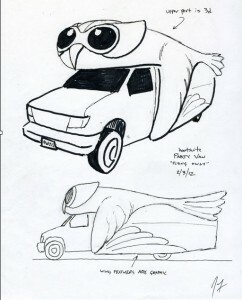 With some hard work, sweat, and imagination a mighty owl wrapped its wings around the sides of the shuttle and thus the HootBus was born! Have you seen the HootBus? Tweet your pic with the HootSuite transporter with the hashtag #HootSX and #HootBus for a chance to win some free swag – whether you’re in Austin or not! This conversation will share tips about wrangling passionate users to help with specific tasks for mutual benefit that truly embrace the themes Sawyer strives for. Dave has invaluable experience with crowdsourcing, seeing success with a multi-language software translation project, organizing citizen reporting at an Olympic Games and creating participatory contests to produce content and assets! Learn how to channel the passion of audiences into tangible results in the same manner Tom Sawyer recruited his fishing pals to help whitewash his fence. Find out more here. To stay on top of all the HootSuite action in Texas, be sure to follow the HootSuite Team Twitter list, hashtags – HootSX and #HootBus – and the HootSuite SXSW Tumblr. 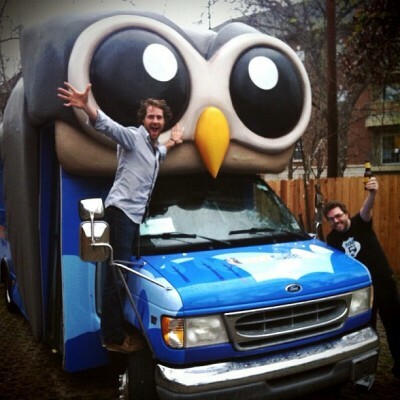 Come find Owly, the HootSuite team, and the HootBus in Austin this weekend! Wherever you find our Owls, you can be sure fun and festivities are close behind.